The international festival celebrating Irish culture with parades, dancing, special foods and a whole lot of green is just around the corner. 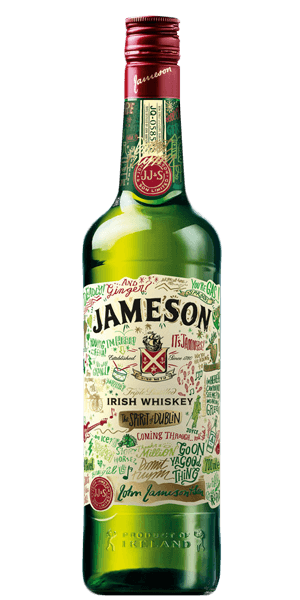 For the ocasion, Jameson has released a limited-edition design of Jameson's iconic bottle, inspired by the sights, sounds and jubilant atmosphere of its Dublin hometown. This is their 4th bottle released in celebration of aSt. Patrick's Day and their rich Irish Heritage. Get your bottle and celebrate too. Sláinte! What does Jameson St. Patrick's Edition taste like? The Flavor Spiral™ shows the most common flavors that you'll taste in Jameson St. Patrick's Edition and gives you a chance to have a taste of it before actually tasting it. Stunning taste & flavour. Triple distilled for a smooth taste.